Growing plants indoors is an enjoyable project for any gardener. 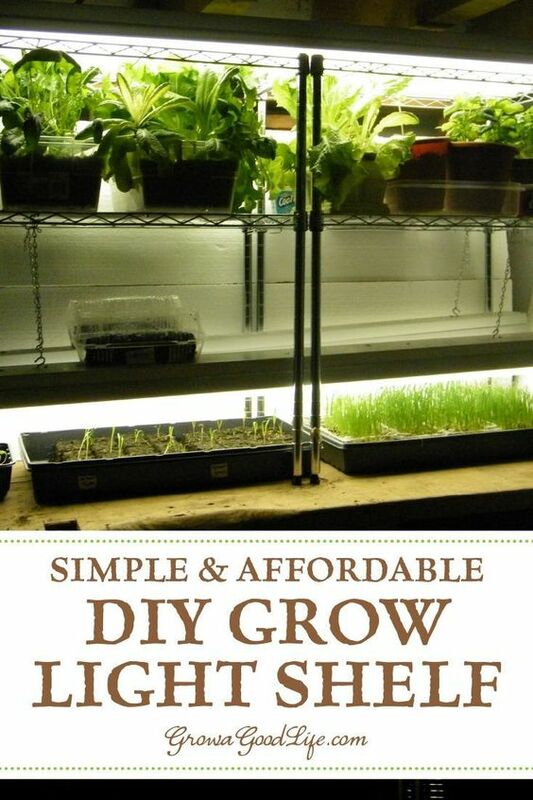 Whether you want to grow herbs indoors, start your garden seedlings, cultivate an indoor garden, or provide some supplemental light to your houseplants during winter, this inexpensive DIY grow light shelf will help you raise healthy plants. It is less expensive than purchasing nursery seedlings. There is a greater selection of seeds available in comparison to the standard plant varieties at most nurseries. It provides a little gardening therapy during the winter months when the ground is under a layer of snow. Once you have your grow light shelving system, it is fun to experiment with growing some edibles indoors during the winter months. Visit How to Grow an Indoor Garden to see what will grow under artificial lights during the winter. In order to grow healthy seedlings and plants indoors, you will need some supplemental light. When I first searched online for growing stands for starting seeds indoors, I quickly discovered that they cost way more than I wanted to spend. A two-shelf unit with 4-foot fluorescent lights was well over $400. If you have the money to splurge on a grow light system, this 2-Tier Garden Grow Light Kit from Gardener Supply is a dream. I was unable to afford such a unit this required some creative thinking to figure out a less-expensive option for starting seeds indoors. After shopping around, this is the DIY grow light shelving system I assembled. It has served me well for many years. You can assemble your own inexpensive grow light system that will serve well for starting seeds indoors or growing an indoor garden. Wire Shelving: I shopped around for a large wire-shelving unit that would accommodate 4-foot shop lights. I wasn’t able to find a large shelving unit locally, but I did find some 23-inch 3-tier shelving units. Two of these units placed side by side are the perfect size to hang two 4-foot shop lights across each shelf. The shelves are 13-inches deep and two standard seedling trays fit perfectly on each shelf. Plus there is room for two shop lights on each shelf if more light is needed. These 3-Tier Shelving Units can be found in big box stores or online. Be sure to select units that measure around 30 inches H x 23 inches W x 13 inches D.
Lighting Fixtures: The lights I use are your standard 4-foot shop light fixtures found in big box stores or online for around $30. These come with chains and a couple s-hooks. You will need to pick up extra s-hooks to hook the chain to the wire shelving. Fluorescent Tube Lights: Fluorescent tubes come in cool, warm, or full-spectrum. Full-spectrum fluorescent bulbs provide a balance of cool and warm lighting that represents natural lighting. Cool white bulbs provide blue/green spectrum while warm white bulbs provide red/orange spectrum. Full-spectrum fluorescent bulbs were more difficult to find locally so I use the standard cool white bulbs. Most seedlings and greens do well with cool white bulbs. You can also mix and match a cool and warm bulb for a wider spectrum artificial light Just be sure to rotate your trays every few days so your plants receive the benefits of both as they grow. Fluorescent tubes lose intensity over time with continued use and should be replaced every two years with fresh bulbs. The older bulbs will still provide light, but the spectrum strength seems to decrease over time. You can use the older bulbs in other shop lights around the basement. Check the packaging of your 4-foot shop lights to be sure you are buying the correct bulbs. Some light strips require T12 and some T8. Shop fluorescent tube lights. Power Strip with Timer: Seedlings require at least 12-16 hours of light each day. I set my power strip timer for 16 hours on, then 8 hours off. The power strip with a timer is also commonly available in big box stores or online: Shop power strips with timer. Plastic Gardening Trays: You will need trays or containers to help prevent water from dripping. These black growing trays measure about 20 x 10 inches and one tray fits perfectly on each shelf. These trays are perfect for seed starting using cell packs, soil blocks, or recycled containers. I like to double them up for a more secure tray that can be moved around without flexing. You can also use recycled produce trays or small plastic storage totes. Assemble shelving units per instructions. Since these shelves are adjustable, make sure they are at the same level for both units. Locate your growing area near an outlet. Try to choose a place away from heavy traffic, pets, cold drafts, and excess heat. Place the shelving units side by side. I situated the shelves on a little used workbench, but they could also be raised up on a folding table to make it easy to tend to the seedlings. Hang your lights from the top and middle shelves using the chains and s-hooks. Plug the lights into the power strip timer and plug the timer into the outlet. Place your plastic gardening trays on the shelves, set your timer, and start growing seedling, and edibles indoors. Keep the lights about 2-inches above the seedlings and adjust as the plants grow. Also check out this article on Expanding the Seed Starting Area to see how I increased my growing space by adding on to this DIY grow shelf. I hope I have encouraged you to assemble your own inexpensive grow light system that will serve well for starting seeds indoors. Once you have your Grow Light Shelving System, it is fun to experiment with growing some edibles indoors during the winter months. 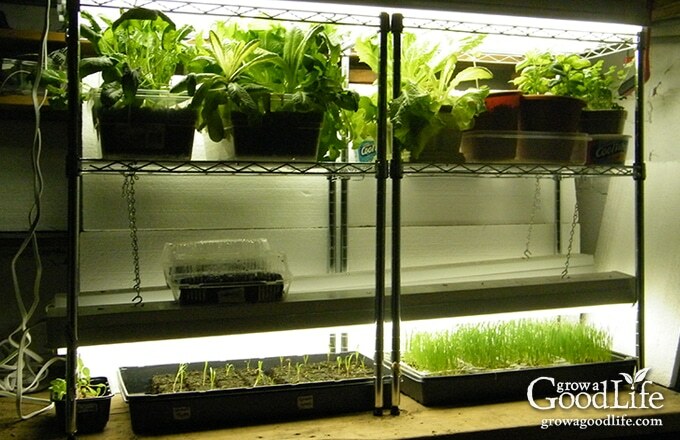 Visit How to Grow an Indoor Garden to see what will grow under lights during the winter. I have almost this exact set up and I’ve just lost some lovely seedlings because the grow light unit caused the the temperature to get way too high. Does this ever happen to you? Are flourecent better? Are three shop lights per shelf too many? I am sorry you lost your seedlings, Maria. What type of grow lights are you using? The ones I recommend do not get hot enough to kill seedlings. Great to know shop lights will work fine! Also, a tip for cheapskates who live in small place with no storage, and only need to start seeds: Adjust the light height by using books/bricks/cans/boards/milk crates. These can be placed under the ends of the lights and/or under your seed/seedling trays, to keep the lights at 3-5″ from the dirt. I put it all on a card table or two for the seed-starting season. For the past few years, I moved my fish tank lights start my hot pepper seeds (Zone 3). The fish tank lights were purchased for growing aquarium plants, but they have burned out, too pricey to replace. So, thanks again for letting me know shop lights will work! How many watts are needed for the fluorescent tubes? I use to have a tanning salon and have extra bulbs. I have been using them as grow lights and they at working fine. Is this ok? If they are working, than sure, it’ ok.
Do you have any idea the ‘cost increase’ in electricity to run these lights for 16 hours? Thanks for any help. Ellen, Sorry, no I do not. However, I am sure the cost of the electricity for the lights outweighs the cost of purchasing organic produce in the grocery store. I would love to be able to print a copy of this article so I can have the instructions at hand to build one of these. It seems all methods of printing the info is disabled on this website. What a shame. I was going to subscribe but it will be an exercise if frustration if I can’t print ideas for my gardening notebook. Beth, All you have to do is hit print on your browser and you can print the page. No special print button is needed. I love this idea! I am wondering what the effect to my electric bill would be. Did you notice a jump in your electric bill from having these lights on most of the day? Amanda, I do not notice a large spike in my electric bill when using these. In any case, the cost of growing seedlings instead of purchasing transplants will balance that out. Great site. Can this grow system be set up in a basement with little natural light? Lee, You will need more than just natural light to grow healthy plants. Hi, Cool site. Thanks. What kind of soil do you need to use? I saw your comment that this set-up will work for other edibles grown indoors, I’m curious about lettuces though. As a more cooler-weather plant, would you lessen the time needed for the lights to be on? Thank you. Really enjoy your articles. Merry Christmas! Joy, Thank you for your kind words. I grow lettuce indoors all winter and stick to the 16 hours on and 8 hours off lighting schedule without any problems. The florescent lights are not as strong as real sunlight and I believe the lettuce grows better with the longer lighting period. Lettuce also grows best in a cool location and will bolt or go to seed if your room is very warm. Do you always keep that two-inch distance between the plants and the lights as they grow? Eric, Yes, I try to keep the lights about 2-inches above the plants so they receive the maximum amount of light without touching the bulbs. I adjust the height with chains on s-hooks. I wanted to say thank you! I built this last spring and grew perennials, annuals and all kinds of vegetables from seeds. I used regular shop lights with full spectrum bulbs (not grow lights) and it worked fine. I had it set up on a timer to go on and off. I am going to go bigger this year as I need more room for all the things I want to start from seed. Wonderful ideas here! I’m glad I found this website. I assumed I would have to buy “grow” lights but you are stating regular shop lights work fine, What exactly is the difference (besides price) between “grow” lights and shop lights? Again, thank you for a very informative site. Marsha, I haven’t spent the money on grow lights so I can’t provide you a true comparison. Most grow lights claim to be more powerful and have a higher spectrum and wattage to provide the plants with more light. 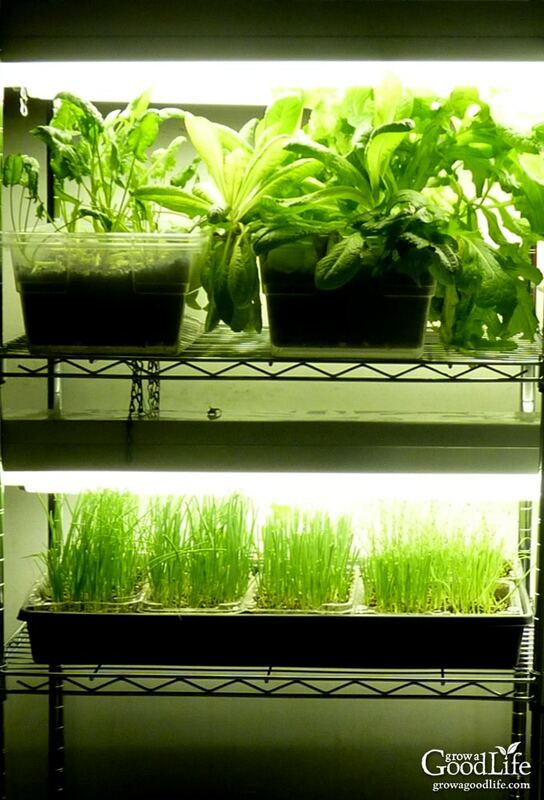 I do know from years of experience, that shop lights work fine to grow seedlings or other edibles indoors. I’m looking to start one of these in my basement. Does it matter wether I use a T12 or T8 fluorescent bulb? Velma, No it doesn’t matter if you use T12 or T8, just be sure your bulbs match your fixtures. T-8 bulbs usually use less power and are brighter. You can get them in daylight also. I have never used grow lights, but instead use a minimum of 6500K temperature lights. I live in the inland northwest where temperature remains sub zero for 3-4 months, and I have an indoors tropical garden that thrives during winter – thanks to the grow lights. I’m planning on growing all winter, so I’m looking for tray that is about 4 inches and will fit on the shelf. Does anyone have any ideas? The window sill boxes flair too much at the top to be able to fit side by side on the shelf. Andrew, Look at food storage containers or small storage containers like the shoebox sized totes. did same but used an old waterbed heater with thermostat for bottom heat. Peppers and tomatoes germinate instantly. I have a heat mat under my seedling which really helps. Grow lights are expensive and I opted for a 5600K light. I built a seed starting station a couple of years ago, best gardening tool yet. After years of not enough window sills and little seedlings getting cold, and leggy and sickly. Looking through catalogs and seeing the price of these things, I went to Sam’s Club and bought a metal shelf on wheels,9 I can roll it out the door if I want to. I have 2 shop lights per shelf, 4 bulbs per shelf. ( Home Depot) I use the regular lights, the Grow lights are expensive and draw more power. set a power strip up on a timer, I don’t see a difference on my power bill. Keep the tops of the plants just under the lights. I hang the foil car windshield shades (Thrift stores) all around to keep in the warm air and reflect the light. I can put 4 trays on each shelf and have 3 shelves set up. Very easy to set up and a fraction of the cost. All you really need to harden off plants is put a fan on them. What a fantastic idea. I am going to try it and add your suggestions. Thank you. Thank you this information is very helpful. I am just building mine for this winter’s crop. This is such a good idea -what a money saver too! Geo, You should be able to find 4 foot Shop Lights easily at any big box home improvement store like Home Depot or Lowes. Power strip timer too. If not, these items can be ordered online and delivered to you. Ooooooo I wonder if this would work with my orchids during winter! Love the idea, thank you ! !